Presented today the Migration and Spatial Ecology of the Spanish population of booted eagle , second monograph of the Migra program , developed by SEO / BirdLife with the collaboration of the Fundación Iberdrola España. To carry out the study, 21 eagles have been marked with GPS and more than 83,000 locations have been obtained that have guided us through the more than 194,000 km covered by the birds in their journeys. There was no evidence of the wintering of the booted eagle in Spain until a few years ago and two of the specimens marked within this study have already shown this change in behavior, which reflects the good character of the birds as indicators of climate change. 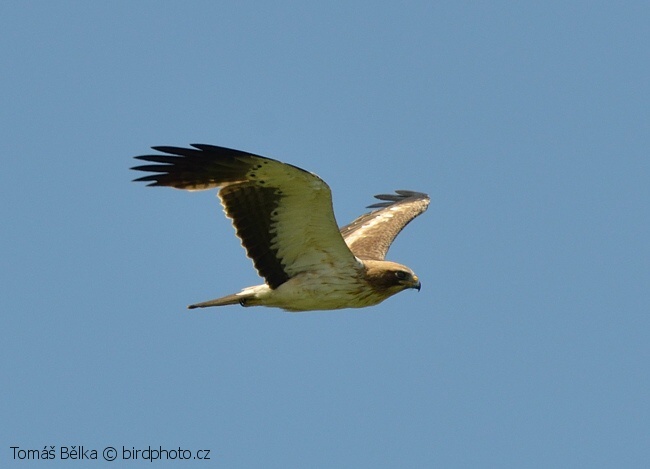 The booted eagle is a migratory raptor that breeds in forest areas throughout Spain. The specimens spend approximately two months a year migrating (14% of the annual cycle), five months in the breeding areas (42%) and little more than five months in the wintering area. These data reinforce the need for global habitat management in different countries throughout the year for the conservation of the species. International cooperation is essential when it comes to creating safe areas for the road eagles. These are the objectives of the monograph presented today on the species of the Migra program of SEO / BirdLife, developed in collaboration with the Fundación Iberdrola España. A study that compiles a work of seven years, started in 2011 and that culminates now with the publication of the Migration and space ecology of the Spanish population of booted eagle . This is the first monograph, a series of publications of the Migra program, based exclusively on marked copies since this program began. These studies are dedicated to know the spatial ecology, movements and migration of birds in Spain. Where are the bald eagles throughout the year? During the breeding period all the adult eagles are found in the breeding areas, located in forest areas of the Iberian Peninsula. But even in the breeding period they use large areas of habitat around their nests reaching up to 75 km per day in search of food, using mainly areas consisting of a mosaic of heterogeneous landscapes dominated by extensions of scrub, agroforestry areas (mainly crops). dry land), open areas, crops and pastures. The majority of the road eagles are trans-Saharan migrants. During their migration they concentrate on the Strait of Gibraltar to cross the sea to Africa, and cross the Sahara desert in broad front, crossing over all of Algeria, Mali and Mauritania. Autumnal migration lasts from the beginning of August to the beginning of October, with an average duration of 23 days. The spring migration goes from February 25 to March 21 and lasts about 28 days. These seasonal differences are due to the fact that in the autumn the routes are significantly straighter and the stopping days are less frequent. The daily flight distance is greater in autumn (143-253 km / day) than in spring (136-234 km / day), with cases of more than 400 km / day. In spring the daily distance traveled is greater when crossing the Sahara desert. Called eagles fly in active migration at speeds between 40 km / h and 70 km / h.
The booted eagles reach their wintering areas in Africa mainly between September and October. They remain in these areas an average of 163 days, until returning to their breeding areas between February and March. The wintering areas are located in the western Sahel, about 2,400- 3,400 km. of its breeding territories. However, there are areas further south, which together gives a strip of more than 900 km of amplitude in which the wintering quarters are located, which cover eight African countries: Mauritania, Mali, Niger, Burkina Faso, Guinea , Sierra Leone, Nigeria and Chad. They occupy mainly surfaces covered by herbaceous vegetation with scattered trees (savannahs) and to a lesser extent mosaics of vegetation and cultivated lands, being scarce the locations in forest environments. Since the 1980s there has been an increase in the number of specimens that remain during the winter in the Iberian Peninsula, and in general in the Mediterranean basin, showing the good indicators that are the birds of climate change. Two marked booted eagles have not migrated to Africa and overwintered in the lagoon of Valencia, only 300-450 km away. of their nests. There they were fed in paddy fields and irrigated crops among orange groves, very different from the usual wintering habitat of the species in the African Sahel. In addition, the booted eagles showed a marked fidelity towards their wintering areas, both in Africa and in Spain. The work has been done thanks to the marking of 21 copies throughout Spain with remote tracking GPS devices. The information of more than 83,000 locations has been analyzed. The collaboration with the Junta de Extremadura, which has been added to these works, has been of great help. The authors of the publication, are recognized experts in the study, space ecology and conservation of raptors of the University of Alicante, Valencia, Murcia, Migres Foundation and SEO / BirdLife. In an excellent work they have compiled and exhaustively analyzed all the available information on the spatial ecology of the booted eagle, which will affect its future conservation throughout its distribution area, and will be a reference work of the species. The Migration program , launched in 2011 by SEO / BirdLife with the collaboration of the Iberdrola Spain Foundation, incorporates the latest technologies in geolocation and remote monitoring systems to learn more about the movements of birds inside and outside our country. Thanks to this initiative you can know the dates of start and end of their migrations, the stopping places and feeding points, the time it takes to make those trips, if they are repeated in the spring and autumn migration, the main wintering areas and dispersion, or if the routes are the same year after year. The Iberdrola Spain Foundation collaborates with this program within the framework of its activity in support of biodiversity, one of its main areas of action. Currently, the Migra program has 783 marked birds, of 32 different species, of which 447 birds of 31 species have provided useful information. This program has more than 300 employees and 50 collaborating entities in Spain and abroad.